A designer must be really great who can create a sailplane, which can remain in service, setting world and national records over 20 years. Such a machine was the Kranich two-seater. The prototype was designed at DFS by Hans Jacobs in 1935 and was built in the autumn of that year. It was an enlarged and developed version of Hans Jacobs’ record breaking single seat Rhönsperber of 1935. In many respects the two were similar in shape and detailed design. The Kranich was produced from 1935 until the late 1950’s. Many hundreds of Kranichs were built in Germany before the War, in Germany, Sweden, Spain and Czechoslovakia during the War, and in Poland, Jugoslavia and Spain after the War. 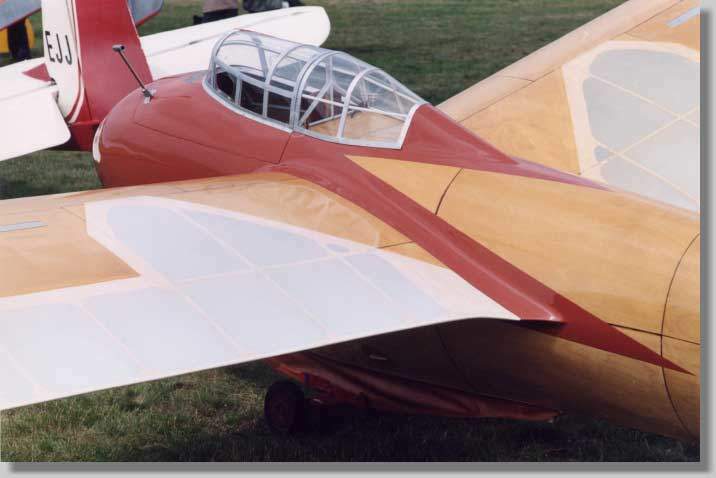 During its long service life, this first mass-produced high-performance two-seater broke almost every record, though at first world records were not easy to set because of the tremendous Soviet two-seater distance records being flown. (407km in 1937 and 619km in 1938) Also, after 1937, the German frontiers were mostly closed because of the political situation. Nevertheless, Kranichs achieved some outstanding records in Germany before the War. 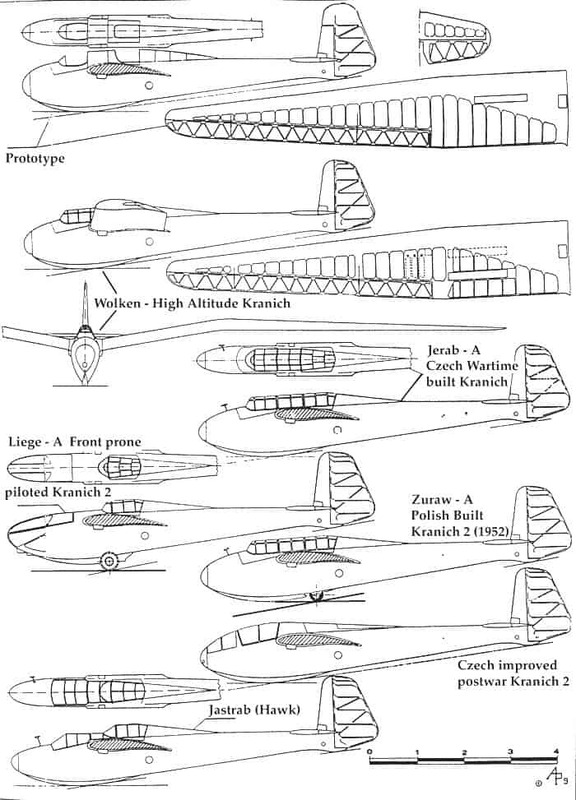 This article describes only the Kranich 1, Kranich 2, the High Altitude Kranich and the Prone Piloted Kranich. 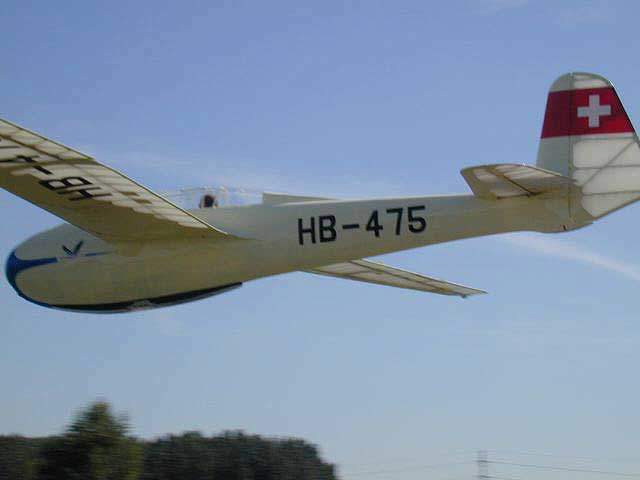 The Kranich 3, designed by Hans Jacobs in 1951, is not described here, as it was a totally different glider. * 1938 Rhön Contest 1st place 2-seater class, flown by Romeis and Schillinger. This was one of the machines that broke up at over 8000m in the turbulence of a thunderstorm on the last day but one of the contest. Both pilots parachuted to safety. 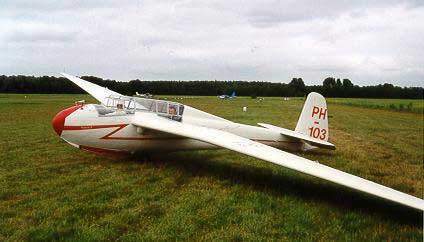 1939 Rhön Contest 1st place in 2-seater class, flown by Kuhnold and Schreder. 1952 World Championships, Madrid. 1st place in 2-seater class of 17 entrants flown by Juez and de Castro. * 397km German national 2-seater record which stood for 30 years. Flown by Hoffmann and Wilcken on 31/5/38. * 6838m World single seater Gain of Height record by Erwin Ziller in wave over Grunau. * 11410m (almost 3800Oft) This World Absolute Altitude record was not recognised, since the FAI did not accept wartime records. The Kranich, probably the high-altitude version, was flown solo by Erich Klockner in wave over Zell am See on 1/10/40. The release point of 6520m (over 1700Oft) was reached after a long tow upwind form Ainring to the edge of a vast Foehn wave cloud. * 21.02h World 2-seater Duration record by Meier and Schneider over the Hornberg 29/6/38. * 50.15h World 2-seater Duration record by Boedecker and Zander over Rossiten 9-11/12/38. An epic flight in icy conditions. * 511.8km World 2-seater Goal Flight record. Palikewicz, Poland. Lesnica~Warez 19/7/51. * 541.3km World 2-seater Goal Flight record. Popiel and Siemaskiewicz, Poland. Lublin – Hrubieszov. 20/7/53. This may be the longest distance flown by a Kranich. The Machine was a Zuraw (Crane), a Polish-built Kranich. * 65.98km/h World 2-seater Speed record round 10Okm triangle, by Fonteilles and Lamplin, France, from le Bourget, 5/5/1951. * 6780m (22577ft) World 2-seater Gain of Height and Absolute Altitude records by Rousselet and Faivre, France, in wave over St Auban, 21/9/1948. * 8162m (2718Oft) World 2-seater Gain of Height record by Brzuska and Parceswiski, Poland, in a Zuraw over Jelenia Gora (Grunau) 1/12/1950. After 1945 National records too numerous to mention fell to the Kranich in many countries. One must remember the efforts of the Cambridge University GC in England, of Lionel Alexander and J.Grantham and of Wally Kahn in Germany. There was the great flight to the Spanish frontier by Hans Nietlispach, in the rear cockpit, in 1957. 2-piece ailerons for lighter handling in flight. A non-aerodynamically balanced elevator. The Kranich 1 is aerodynamically balanced. An elevator trim tab. 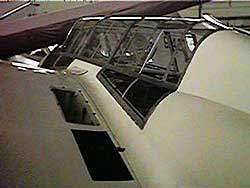 The Kranich 1 has no fore-and-aft trim. The alterations made the Kranich 2 heavier than the 1. Cockpit placarded empty weights of a Kranich 1 and 2 were noted as 640 and 7121b respectively. The Kranich 1 was still in production in Sweden in 1943 and probably all Kranich 1s had their one-piece ailerons fitted with servo tabs during the War. Kranich production continued in Spain into the late 1950s and it is possible that the last batch were built with Aerolite glue. 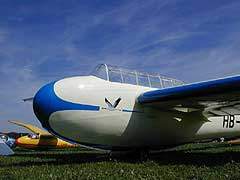 Because of the great successes of German glider pilots before the War the NAZI Government decided that gliding should be one of the main methods of training military pilots. Thus several types of sailplane were modified for use by the NS Fliegerkorps (the youth organisation equivalent to the British Air Training Corps), and the Luftwaffe. 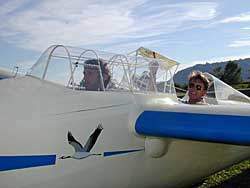 The Kranich was chosen to be the standard high performance training two-seater. In this machine, dual instruction could be given in almost every aspect of flying, including blind flying and the use of oxygen and radio. Kranich in Military Operations at the Front. At least on one occasion, probably some time in 1941, Kranichs were used to transport petrol to surrounded Panzers in Russia. The tanks did have some fuel, but needed more to break out. The load, 5001b (50gal) was carried in the rear seat position. The towplanes were JU 87B Stukas. The towing speed was about 100mph. The Kranichs released some distance from the tanks. The Stukas went on to attack the enemy. The Kranichs approached silently to land in a marked field beside a wood in which the tanks were hidden. The tank crews then refuelled their tanks and demolished the Kranichs with explosives. The Kranich pilots escaped on foot. Eighty Kranichs were prepared for possible use in the planned invasion of Britain. This was designed and built shortly before the War. It had increased dihedral and “gull” to give more lateral stability in high altitude turbulence. Aileron and elevator control cables were replaced by tubes, which were supported by light bearings because of their considerable length. This was to eliminate expansion and contraction of the cables through temperature changes. Because of this, a pilot had much better feel of his machine, and the new control system was a great success. Six oxygen bottles were carried on reinforced ribs in the outer wings and were accessible from below. They were sufficient to provide one to one and a half hours breathing for both pilots. The Auer (pressure demand) respirator was fitted. The air brakes were of DFS type (Weihe fashion) and rotated open on a torque tube. This was almost certainly the type used for the 11410m wave flight. This was first built in 1943 and a small batch were completed at Edmund Schneider’s factory in 1944. The machine was probably similar to a standard machine except for the modified nose. The object of the aircraft was to test the effects of “g” on a prone pilot. It was found that a prone pilot could stand about double the positive “g” that a normally seated pilot in the rear seat could. The chief problem for the prone pilot was caused by excessive pressure from supports on chin and chest due to being so far ahead of the aircraft C. of G.. The machine was doubtless also to be used for training pilots to fly various prone-piloted projects, such as DFS 228 and KLS 255. The max L/D with one or two pilots was practically proved to be 23. Min sink was 0.69ms. After the War the Kranich was felt not to have the best L/D of available sailplanes, but to be among those that had the best penetration. Ted Lisakowski at Lasham has said that in Poland, tests had been carried out between a Kranich and a Bocian, and that there performance had been found to be remarkably similar up to 8Omph. At that speed, however, the Kranich’s controls were rather heavier than those of the Bocian. During my flying career I have had the good fortune to fly a Kranich 2 in France and two Kranich 1s in Britain, and was able to take both versions cross-country. Both had light and effective ailerons, and were extremely good at thermalling, even when flown dual. Climbing performance when flown solo must be phenomenal! A memorable experience was to share the flying of a Kranich 1 in the Lasham Regional Contest of 1972. During six contest days we found that we could keep up with many of the more modern gliders on cross-country flights, and we were able to climb as well as any aircraft there. In a handicapped regional contest, the Kranich, after all those years, still seemed competitive. However, a Kranich 2, with large airbrakes, is preferable for field landings. The one drawback is the lack of vision from the rear cockpit. This becomes better with the canopy removed. However, Instructors became used to the poor visibility even with the rear canopy in place. Nietlispach’s great flight in the back seat is evidence of this. The poor visibility from the rear led many designers in different countries after the War (and during the War in Germany – the Variable Sweep H.20) to try to improve on the Kranich. Yet it still seemed in the 1970s that no other club two-seater could match the Kranich for all-round performance and handling. The machine may seem to stand high up and to be very heavy. I believe though, that it weighs less than a Bocian and that, without wheel or droppable dolly the canopy top is no higher than the Bocian. After 1945 there were five Kranichs in Britain. Cambridge University GC owned a Kranich 2. The Royal Navy had a Kranich 1 and a Kranich 2, and another Kranich 2 is thought to have been at Farnborough. All of these came from Germany. The Cambridge Kranich, (BGA 494, G-ALKH), after a distinguished career in Britain, went to Eire, and finally was destroyed during the making of a film in the 1960s. (J.Cochrane was involved). Both the Navy Kranichs were brought to Britain by John Sproule, with a Mü 13 and a Meise. The Kranich 2 was spun and destroyed in Australia. The Kranich 1 probably died through glue failure at some coastal RN airfield. The fate of the other Kranich is not known. During the early 1960s further Kranichs were imported from Sweden and some the RAF brought more from Germany. The exact number is not known – possibly seven. Details of German National and World Records were taken from “Handbuch des Segelfliegens” by Wolf Hirth. More details were obtained from “Die Bertluhmtesten Segelflugzeuge” by Georg Brutting, from “Thermik” concerning the Prone Kranich, and from “Sailplane and Glider 1944” concerning the High Altitude Kranich. For the military details we are indebted to Kurt Kummel of the Munster Oldtimer Club, who was one of the pilots.